7th Sunday of Pascha – Holy Fathers of the First Ecumenical Council Why do we commemorate the First Ecumenical Council and read the High Priestly Prayer of Jesus between Ascension and Pentecost? Brothers and sisters, this is only now a week before Pentecost. We just had the Ascension this week on Thursday, then Pentecost the next weekend and we will have almost completed the Pentecostarion period. This reading is in context with all of the other readings, all of the other Sundays including Pascha and including the Ascension. We should understand why it is where it is during the church year and what it means. At Pascha the Lord trampled down death by death and upon those in the tombs bestowed life. He made our flesh capable of eternal life and conquered death. And then follows the period in between Pascha and Ascension, a time when the Lord is on the earth. And what is He doing with His apostles and disciples? He’s teaching them. He is enlightening them because they didn’t understand everything all at once, and He had to teach them many things, many dogmas, many ways of thinking, to have the right priorities, the way to look at things, interpreting the Scriptures to them. He did this and we have some of His appearances recorded in the Scriptures. So we have: Thomas, who doubted and then believed and proclaimed the Lord as God and Man when he said, “My Lord and my God”; the Holy Myrrh Bearers; the Samaritan Woman, which is really the dialog with the soul; the Blind Man and the Paralytic. We see how they were enlightened in various ways. It is all about enlightenment during this period of time until Ascension because the Resurrection must be realized inside of us. The Kingdom of Heaven is within us. The Resurrection as a historical fact has no meaning for us. It must be inculcated in the way we live. If we don’t live the Resurrection, then the Resurrection does not affect us. There are a lot of people that are going down the broad way to hell. The Lord was resurrected for all of them, but many of them will not live. So the Resurrection must be realized in us. That comes from enlightenment. Now, enlightenment comes from the Lord teaching us and also us being receptive to that teaching and responding to that teaching. So it is God’s grace and our efforts over time which enlightens. And these Gospels and these Sundays preceding the Ascension really are talking about them. That’s the overall theme. In Pascha, He showed that He conquered death, and in the Ascension he showed that our flesh would be able to rise up and be with Him and be with God the Father because Jesus Christ, as a human being rose up into the Heavens to be at the right hand of God. And so can we rise up into the Heavens to be with Him in the flesh. That’s what the Ascension teaches us. Now we have this in between period, between the Ascension and the bringing of the Holy Spirit. So why this Gospel at this point in time? This Gospel, if you read it carefully, is a dogmatic explication of who Jesus Christ is, that He is fully equal with the Father, that He is begotten, not made, and He is one in essence with the Father. He speaks to the Father as an equal when He speaks to Him as God. inferiority to God the Father because as a human being, as a man, He is inferior. The Scripture says He was made a little lower than the angels; He became man. But when He speaks as God, He speaks as an equal. He says that all the things that He has, the Father has, and all the things that God the Father has, He has. So it is an explication of Jesus Christ being fully God and fully Man. So He has the authority to send the Holy Spirit to us. He has the authority to tell us how to live. He lived the way He told us, so He has the right to tell us to live that way. This is eternal life, to know God. How do we know Him? Part of this knowledge is a proper dogmatic understanding. In First Ecumenical Council which we are commemorating today, the 318 holy fathers proclaimed the dogma of Who Jesus Christ is, that He was not a creature as the arch-heretic Arius asserted. Arius was a protopresbyter of Alexandria, and he was very erudite, and he got himself a bit of a following, and he said smooth words. The Bible says such words that are smoother than oil and yet they are darts. And the simple people and even simple bishops and simple priests started to believe him that Jesus Christ was created by the Father before time but created so He is a creature. A creature is not equal with God. And yet Jesus Christ spoke to the Father as an equal. He cannot be a creature. And this is important. Many people died over this heresy. There was a lot of controversy – if we had been there, we would have wondered what the decision might be. The truth was not entirely clear for a while because Arius was very intelligent, very good as a rhetoritician and so he swayed some people. But especially through the auspices of our very own patron, Saint Nicholas, who slapped Arias because of his heresy – and later on the bishops of that council saw in a dream that Nicholas was with God, because they had deposed Nicholas for slapping Arias — the truth won out because the truth always will win out. But remember, when the truth is winning out, it doesn’t always look all that truthful as it is winning. That’s the way life is. We are ascending to perfection, but we are making a lot of imperfect steps on that ascent. So we are to be one as Jesus is with His Father, but that process is an arduous one and a difficult one and one with missteps. That’s what happened in the first council; we shouldn’t be afraid of saying it. But the Holy Spirit was with them, and the truth won because God had holy ones in that council, Saint Spiridon also, Saint Nicholas, St Athanasius the Great, and others who spoke for the truth and made it clear that Jesus Christ is only begotten of the Father, begotten, not made, one in essence, by Whom all things were made. 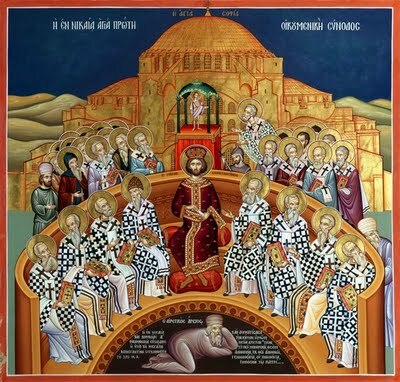 And about two thirds of the Creed, of our symbol of faith, was formulated in the Council of Nicaea. What did the fathers stand for? Truth. Jesus Christ is truth. Truth is not a thing. Truth is a person. He is the truth and the life. That’s why it’s important to not let anyone sully His name in any way. Most of the major heresies that the church was assailed with were some kind of attack on Jesus Christ. Arianism was only one of the first. There were many others: Monothelitism, all kinds of ones that are really hard to pronounce if you start saying them fast. But they were all attacks against the person of Jesus Christ, either His divinity or His humanity or some combination of attack between the two. The Creed formulated, for all time, what was always true and what we always believed and what we will continue to believe. But the Creed was not just a statement of factual information. The Creed is a statement of dogma and morality because Jesus Christ is our example of morality. To believe in Him correctly is to follow Him. So this is what the holy fathers were doing. They were proclaiming the truth about Him with courage. And since Jesus Christ is pivotal to our faith, we partake of His body and blood in every Divine Liturgy. We must know Him in order to have salvation. He is the only path to the Father. He sends us the Holy Spirit which proceeds from the Father. Everything about our faith is about Jesus Christ. Saint Justin Popovich once said that the answer to every question is Jesus Christ. So it is very important to have a correct theological understanding of Him. And you can have that correct understanding in words if you say the Creed and even if you believe the Creed as well as you know it. But the only way to really have a correct theological understanding of Jesus Christ is to know Him. Eternal life is the knowledge of God, and the knowledge of God comes from living as Jesus Christ lived so that we experience what He experienced and we become what He is, holy, humble, compassionate, having unceasing prayer. That’s a commandment. Does it seem impossible to you? It is very possible. It has been attained many times. Unceasing prayer while on the earth, by human beings. Salvation is the knowledge of God, and it is also to be one with God as Jesus said He was one with His Father, these two things, to know God and to be one with Him. And the council shows us this knowledge of God, proclaiming Him correctly, very carefully, dogmatically. And it also showed how to be one with Him. And as I said, the council wasn’t always one. There was argument, and there was really the appearance that Arius would win the day because he appeared to be smarter than anybody else. He was really just an educated fool, but he appeared to be smarter. So for a time there did not appear to be unity. But where there is the love of God, always unity will win out. And so this is why this reading is between Ascension and Pentecost. Because with the coming of the Holy Spirit now comes enlightenment for every man, the Holy Spirit abiding within us, teaching us the things that cannot be uttered, teaching us the things of Christ, the things of God, how to live, how to think, how to struggle, the Holy Spirit abiding in every man. We must believe in Who God is and not have any false ideas about Him. So the Church guards the dogmatic definitions of God carefully, through, for instance, the symbol of faith and really through all of our services and our way of life. But if you don’t guard this definition of God by living according to it, then all is lost for you because the truth is no good to you unless you live it. And so here we see an example of the truth being lived: Jesus Christ proclaiming the truth about Who He is, and then we see historically the holy fathers proclaiming who Jesus Christ is, with very exact language. And this exact language can only be understood if we live it. Then you’ll know. Just as the answer to every question is Jesus Christ, also the answer to every question is become holy. If you do not understand how God can be Trinity, become holy and then you will understand. If you cannot understand how God can become man, become holy and then you will understand. These are things that the impure mind cannot comprehend, the mind that’s full of all kinds of stuff that is not of God, can’t understand the things of God. And remember, eternal life is to know God. He proclaims it. In my opinion, this is the best definition of eternal life — and there’s probably 200 definitions of eternal life in the Scriptures that all basically say the same thing in different ways. But this one says it very clearly: “This is eternal life, that they may know Thee, the only true God and Jesus Christ Whom Thou hast sent.” So I’ll tell you, it is dogmatic understanding of God and living according to that dogma. And we see that example in the holy fathers of the First Ecumenical Council. So we must live according to that example. Now we are in this period waiting for Pentecost. Of course we know that the Spirit has come. The Spirit lives in us. Let us listen to the Holy Spirit teaching us how to live. What is important? All that’s important is to know God. There’s nothing else that matters in the entire world. Nothing matters except that you know God intimately, personally. The only way you can do that is to worship Him in spirit and in truth. The “in truth” part is dogmatically understanding Who He is, not proclaiming Him to be something that He isn’t. And “in spirit” is to live according to what He taught you. It’s a difficult thing, but with the Holy Spirit we can. May God help us to always proclaim Who Jesus Christ is, not just when we say the Creed, but by how we live. Amen. This entry was posted on Sunday, June 5th, 2011 at 7:04 am and is filed under 7th Sunday of Pascha - Holy Fathers of the 1st Ecumenical council, Homilies. You can follow any responses to this entry through the RSS 2.0 feed. You can leave a response, or trackback from your own site.